Jenise Zamora Galindo won the Selva Annual Weight Loss Contest and earned $1000 towards her wedding. Selva, “The guys learned that cutting weight was one thing but going up against a woman trying to get into a wedding dress is something else.” She lost over 50 pounds. 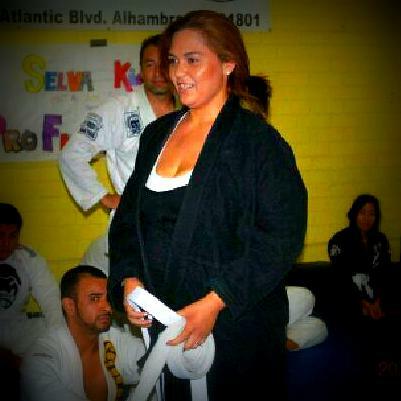 For Jenise Jiu-Jitsu is a family affair. She trains with her boyfriend and son. Jason Selva puts up the money himself and gives his students six months, January to July, to lose the weight and win the money. Selva says that the top five students lost a combined weight of over 300 pounds. Selva and the other coaches work with the students not only with Jiu-Jitsu techniques but with nutrition too. [bjjad][/bjjad]Our 3 Finalists!!! Over 200lbs lost between them. We had (2) winners for the $2,000 Cash Jenise and Sabri!!!! — with Jenise Zamora Galindo, Mario Nevarez and Sabri Gerges.